United Nations Children'sFund (UNICEF), along with the National Working Committee on Children and Women (NWCCW) and the National Bureau of Statistics (NBS), has published the 2014 "Children in Asia: An Atlas of Social Indicators", providing perspectives of the various situations of children in China. The nutrition status in a population is indicated by the prevalence of stunting (low height for age), underweight (low weight for age) and wasting (low weight for height). Evidence indicates that the first 1,000 days of life is the most critical period as this is when nutritional deficiencies have a significant and often irreversible adverse impact on child survival and growth. Micronutrients, particularly iron, vitamin A, zinc, iodine and folate, play a vital role in a child's development and health. Anemia, the effect of a deficiency in iron and other vitamins in the diet, prevalence of children under 5 years was 13.3% in rural areas; while for children aged 6-12 months, the prevalence was 28.2%. 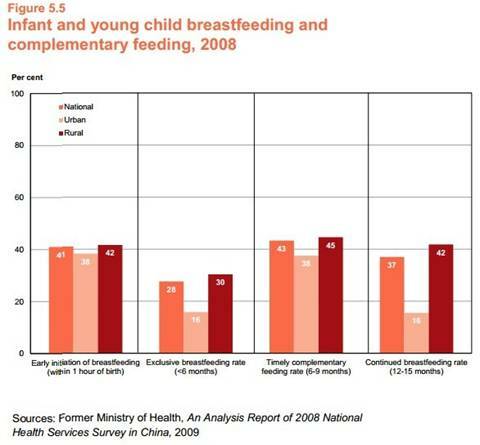 In 2009, China approved a complementary food supplement (Ying Yang Bao) to prevent micronutrient deficiency of infants and young children. However, the process of becoming malnourished in children typically begins in utero, and in 2006, anemia prevalence of pregnant women was 37.7% in China. Globally, iodine deficiency is the primary cause of preventable learning disabilities and brain damage for a developing fetus. China adopted Universal Salt Iodization (USI) in 1994 to prevent iodine deficiencies. In 2011, about 98% of counties were consuming adequately iodized salt. The prevalence of overweight and obesity increased three times from 1982 to 2002 among urban children and adolescents aged 7-17 years old. In 2002, the prevalence was 11.5% in cities and was as high as 16.7% in bigger cities. 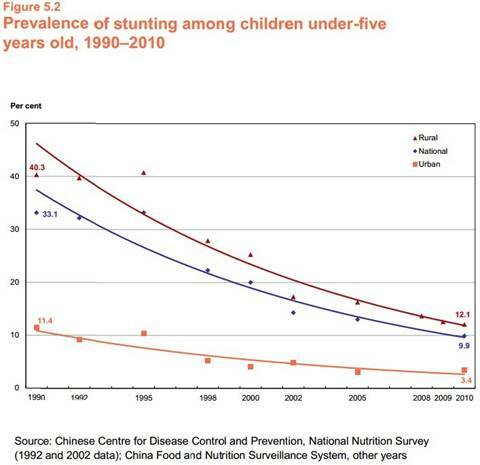 China has 6.5% of the world's stunted children globally. In 2010, stunting prevalence of children under 5 years was 20.3% in poor rural areas. Stunting is caused by poor feeding over a prolonged period and by the inadequate prevention and treatment of disease and infection. UNICEF and WHO recommend that during the first six months of life, infants should be given only breastmilk, and that after six months, other foods and fluids should be introduced, but breastfeeding should continue for at least two years. Despite the benefits, many mothers replace breastmilk with substitutes, like expensive feeding formula, which is not nutritionally equivalent and exposes children to dangers, such as infections and contamination and increases the risk of certain chronic diseases later in life.